111 min. A24 Films. Director: Barry Jenkins. Cast: Mahershala Ali, Shariff Earp, Duan Sanderson. In skillfully adapting Tarell Alvin McCraney’s unproduced play In Moonlight Black Boys Look Blue, writer-director Barry Jenkins (Medicine for Melancholy) shows a deep curiosity about one person’s development and inner life. We see this person grow from boy to teenager to man over the film’s three acts, and although the trappings could easily play as clichés, Moonlight clearly comes from a (literal and figurative) real place for both creators. McCraney, who is homosexual, and Jenkins, who is heterosexual, both had drug-addicted mothers and both grew up in Miami's Liberty Square housing development, where Jenkins returned to shoot the film. Filled with extraordinary performances, Moonlight explores the tension between private and public selves for a closeted black individual who feels pressure to conform to traditional but arbitrary standards of masculinity. The film's first act deals with the child version of Chiron, known by the nickname "Little" (Alex Hibbert). When Little runs from bullies, he catches the attention of local drug dealer Juan (Oscar nominee Mahershala Ali, also of Hidden Figures and House of Cards), who offers the boy temporary refuge at Juan's house, which he shares with girlfriend Teresa (Janelle Monáe). The next day, Juan returns "Little" to his emotionally abusive, crack-addicted mother Paula (Oscar nominee Naomie Harris), who gets her fixes from Juan. Despite the simmering tension this creates between the boy and the man, "Little" gravitates to his new father figure, who offers advice and comfort and, in a baptismal tableau, teaches the boy to swim in the ocean. Chiron has also begun to feel pubescent stirrings for a classmate, the apparently bluff Kevin (Jaden Piner). A time jump takes us to Chiron's teenage self (Ashton Sanders), who still pines for Kevin (Jharrel Jerome) although the terrain has only become more dangerous as young men assert the violent machismo expected of them. The film's third act finds the adult Chiron, now going by "Black" (Trevante Rhodes), reconnecting with Kevin (André Holland) after years apart. Aside from one needlessly showy shot (the film's first), Jenkins fosters in his direction a visual elegance and a grounded confidence, getting exceptional work from each timeline's acting ensemble. Nicholas Britell's use of original music and repurposed classical and soul cuts helps to subtly modulate the film's many melancholy moods. Perhaps what's most surprising about Moonlight is Jenkins' ability to assemble that collection of elements that brush with cliché and express each element as an emotionally resonant truth. Certainly we have seen the crack-addicted mother in the projects before, and her struggling child—fostered by a drug dealer—coming up into a life of crime. So too have we seen the conflicted gay youth, overcompensating with archetypally male bravado to cover up and protect his true self. And in a way, Moonlight compounds its own challenge by only alloting about thirty-five minutes to each movement in the symphony of Chiron. Miraculously, Moonlight makes us believe in Chiron (and the influential figures around him) in no small part because it gives equal weight to each chapter in his life, dodging the familiar structure of a short childhood passage leaping to a dominant adult narrative. That deceptively simple but unconventional screenplay structure may have the most to do with why Moonlight has struck such a chord with audiences and critics and the Academy of Motion Picture Arts and Sciences, which doled out eight Oscar nominations, including Best Adapted Screenplay and Best Picture. After all, most viewers of the film have literally been there—through childhood, adolescence, and adulthood—on a neverending and confusing journey toward self. 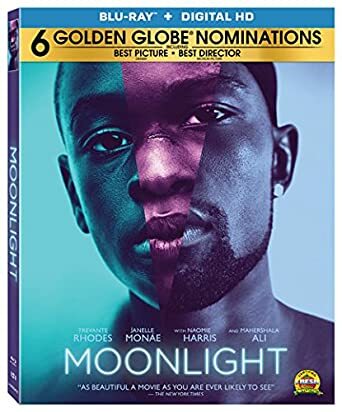 Lionsgate sends Moonlight home in a timely Blu-ray + Digital HD special edition timed to chase its high-profile appearance at the 2017 Oscars. The hi-def transfer offers a sharp and richly colorful and film-like image that preserves the director's intentions. Well-calibrated contrast and a rock-solid black level contribute to an impression of depth, with low-lit scenes holding up remarkably well. The DTS-HD Master Audio 5. mix maximizes the source elements by giving full body to the striking music while prioritizing clear, crisp, front-and-center dialogue. This is also a mix that provides some nice, subtle ambience in rear channels to create an immersive environmental effect. Bonus features include a thoughtful and amiable audio commentary with director Barry Jenkins, who discusses the development of the script from its stage origins, how the backgrounds of he and the playwright mirror those of the characters, work with the actors, and other production specifics. Three creditable featurettes round out the disc: the behind-the-scenes "Ensemble of Emotion: The Making of Moonlight" (21:37, HD) with B-roll and cast and crew interviews; "Poetry Through Collaboration: The Music of Moonlight" (10:06, HD) featuring Jenkins and composer Nicholas Brittle, and the self-explanatory "Cruel Beauty: Filming in Miami" (5:39, HD). All site content © 2000-2019 Peter Canavese. Page generated at 04/18/2019 01:27:41AM.